On July 11, 2017. Hotel Oakland Village celebrated the 4th of July with 280 residents, family, friends, and chore providers. Hotel Oakland Associates Principal Partner, Mr. Bill Langelier, his family and Megan also took part in the celebration. During the ceremony, Mr. Langelier dedicated the Village lobby to his mother, Rita M. Langelier, because of her inspiration for the formation of the Hotel Oakland Village. A beautiful photo and plaque commemorating her dedication was placed in the lobby. Our resident performers worked very hard to prepare for the celebration and the festivities were touching and exciting. Performances included singing, dancing, and a special guest pianist who was only 14 years old! Residents were very excited and proud to see all of the performances. Everyone applauded with smiles on their faces. At the end, everyone received a delicious pound cake provided by Mr. Langelier. Happy 4th of July and always remember, Participation = Good Health! Greetings Hotel Oakland Village residents! This gathering of village residents is to celebrate the Fourth of July holiday. Thank you for coming to such an important celebration of the birth of the United States of America. Before we begin the festivities, I would like to share a story about a very special person who was the inspiration for the formation of the Hotel Oakland Village six years ago in July of 2011. My mother experienced isolation for many years in her retirement community in Boston. She was not alone. Most residents of her senior independent living community were isolated and did not engage in any common group activities together like we do so regularly at Hotel Oakland Village. As you know, isolation is dangerous to your health and can shorten your life. Our goal at Hotel Oakland Village is to end isolation and live longer! My mother’s isolating experience led me to believe we could do things differently here at Hotel Oakland and the idea of the Hotel Oakland Village was born. When Megan and I proposed the formation of the Hotel Oakland Village in 2011 to fight isolation, we had no idea how this simple concept of Health Groups that focused on Health Education and social interaction could transform the Hotel Oakland Village community that was mostly isolated into a vibrant, energetic, and healthy senior residence that has dramatically increased your well-being. Our motto, Participation = Good Health is indeed the basis for our great success with 15 energetic Health Education Groups in 2017. My mother was the inspiration for the Hotel Oakland Village formation in 2011 and I believe it is fitting to recognize this by dedicating the Hotel Oakland Village lobby to my mother, Rita Langelier. Her inspiration to end isolation will never be forgotten at Hotel Oakland Village. This lobby will now be known as “the Rita M. Langelier Lobby” at Hotel Oakland Village. Thank you mom and always remember, Participation = Good Health! Following the words of Bill, his mother, Rita M. Langelier, was the true and loving inspiration behind our Hotel Oakland Village. 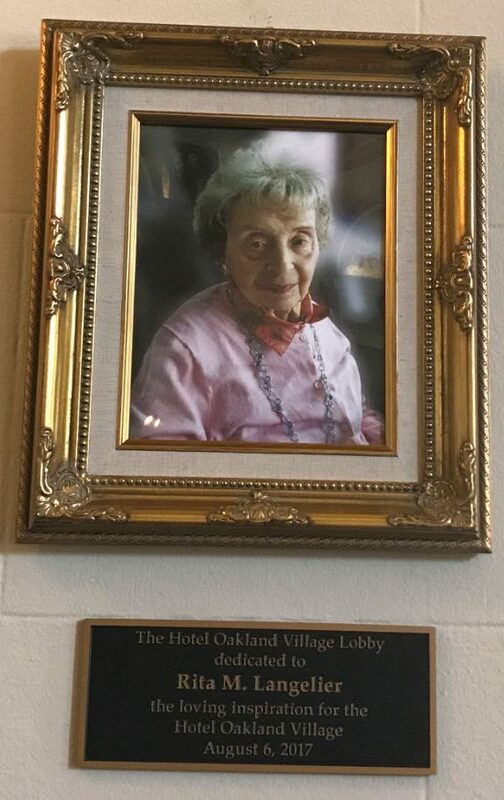 So I am both proud and honored that we dedicate the Hotel Oakland Village lobby in loving memory of Lady Rita M. Langelier. We shall always carry in our minds, that our life at Hotel Oakland Village is inspired by Lady Rita M. Langelier offering us this senior house, not merely a house but a warm and healthy home for senior residents. We are deeply grateful to the spirit of Lady Rita M. Langelier who inspired and helped build the Hotel Oakland Village. ← Three case studies to show the different phases of care available free at Hotel Oakland Village!